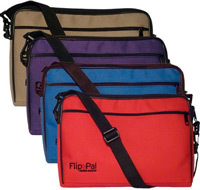 Protect your Flip-Pal™ mobile scanner with this deluxe carrying case. It has just the right-size outer pocket for your batteries, charger, and or spare SD cards. This sleek case keeps you organized while you are on the move, and gives your scanner the maximum in protection.